SMC has been around for some time. They have buffed up the looks of their Barricade routers, so whereas earlier models have looked either ugly or quirky, this WBR14-N is understated and appealing. It's a big step forward and puts it in line with similarly priced routers on the market. Just as the looks are fairly conservative, so too is the specification, which appears to follow a reference design from Ubicom. There's an Atheros AR5416 wireless chip, four 10/100 ports controlled by a Realtek chip and the same Ubicom StreamEngine that we saw in the D-Link. SMC doesn't provide a USB port either for printing or for Windows Connect Now, but you do get a flick switch to turn the wireless on and off. This is a handy feature as we found that although the configuration screen was clearly laid out, it was very slow to respond. You'd have to hope this would be addressed in a firmware update. The wireless wizard helps you to set security by terming WEP, WPA and WPA2 as Good, Better and Best. Strangely enough, SMC sells matching PC Card and PCI card adapters, but not a USB model. There's no denying that it's tricky to package three or more antennas in a USB key, but if you don't have a spare PC Card slot on your laptop, then USB is better than nothing. 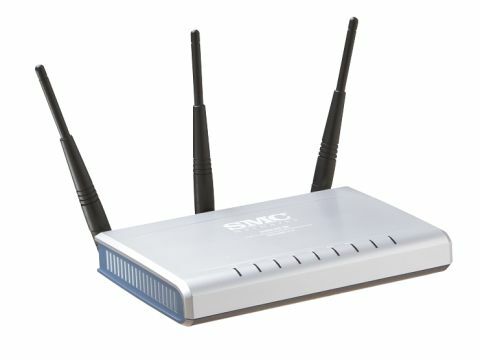 Both the SMC EZ Connect N Utility for the adapters and the configuration screen for the router look very similar to the D-Link software. This is fine as it works well, but every aspect of this router looks as though it has been borrowed from another make and model. In use, we found the connection rate and maintained speed were more than acceptable and, while it's not the fastest router here, it got the job done. The price of this router is quite low and it's good value; however, the lack of Gigabit LAN is an annoyance.